I am a huge fan of photos. I love taking them, being in them (if prepared!) and looking back through them to get a little hit of nostalgia. Which is why, when I was offered to try out the photo printing services with Tesco, I jumped at the chance. I decided to create one of their photo canvases, as we only actually have one canvas up on display currently in our house, and I thought it would be a nice addition. Tesco Photo is simple to use, with traditional photo printing, canvases and other photo gifts available all in one place. Tesco offer a fantastic same day service for their canvases, but I was feeling a little lazy so opted for delivery instead. The site is simple to use, although I would say I either had issues or there aren’t enough options to adjust an image to fit the canvas as I couldn’t use my first choice as it would have cut off a couple of the people in my photo, which was a shame. Like I say, this may have just been an error when I was using the site, but if not, it is worth noting that images might need to be cropped to fit the canvas. 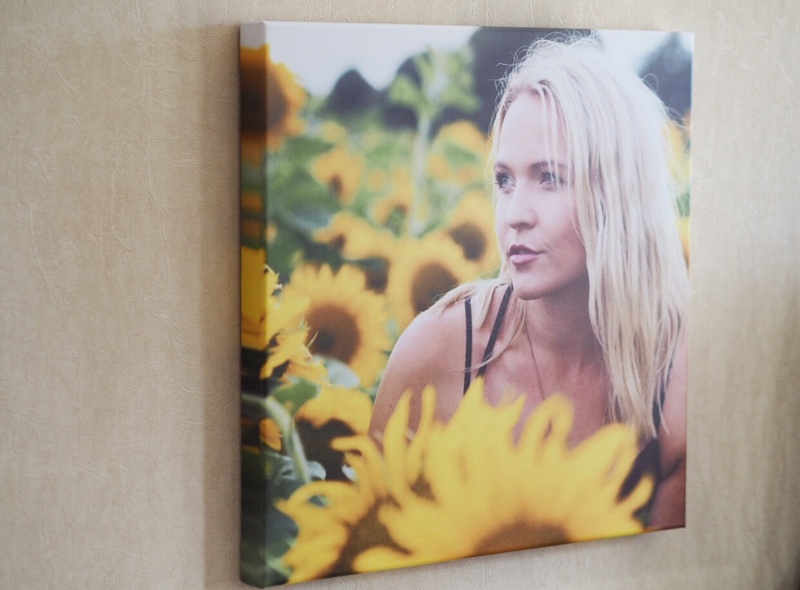 In the end I went for a photo of myself, which was taken by my lovely friend Ciara on a recent photo shoot, as I love the shot and thought the yellow of the sunflowers would really help brighten up our hallway! There are a few options when it comes to creating the canvas, there are a few different sizes to choose from (I went for the 20×20 size), you can go for landscape or portrait and you can choose for the sides to wrap around, mirror or stretch. You can also opt to add in some text, which I decided against as I think the image itself is enough. However, this would be perfect if you are looking to personalise your canvas or if you are creating it as a gift and wanted to add a little inscription. Delivery was really fast, it said around 8 days, but I ordered it on the Thursday and it came Saturday morning, so I was very impressed. The canvas came well protected in bubble wrap, and the quality was pretty good. The image I had used was taken on my Olympus Pen camera, but had been edited in Instagram, and screenshot onto my phone, so I wasn’t expecting a high res finish. The colours were nice and bold and bright, and when I hung it quickly in the hallway I was impressed by how it looked displayed. For the simple to use website and fast service (as I mentioned, I could have collected the canvas on the same day if I had of wanted to), I would definitely recommend Tesco’s photo printing. I was provided with a code to purchase the canvas from Tesco Photo for the purpose of this post, however all words and images are my own. Thanks to Ciara for the lovely shot of myself used for the canvas.